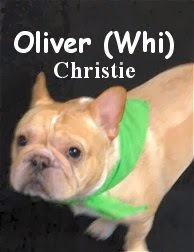 Fort Fido Dog Daycare & Boarding News Blog: All-About-It Oliver! This last Saturday we got the opportunity to meet with Oliver. He is a five year old, twenty-four pound, cream/fawn colored, French Bulldog. Oliver had his assessment in The Fort's Medium Roll. In there with the others, he loved it! He did an excellent job, meeting and greeting with several pack members. Oliver's enthusiastic and active personality, made him a fun dog to have around here. We look forward to his return to Fort Fido, he is welcome anytime. We were even lucky enough to score a couple clips of Oliver, getting to know the livewire, Pupcake. These two really got along well together.